On April 2nd, 2007, I received a call from my mom at about 1am. 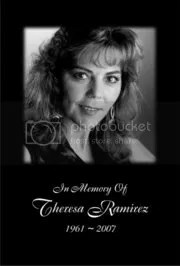 She had called to notify me that my Aunt Teresa, who had battled breast cancer for 7 years, had passed away. I laid there in bed, numb…just numb. One of my favorite people in my life had just died at a young age of 45. How can this be? Why her? Why does this happen to good people? A couple of days before on Friday, March 30th, Beatriz and I were sitting around the dinner table. My aunt had already been in the hospital for over a week and for some reason, I stopped eating, told Beatriz out of the blue I wanted to see my aunt, NOW. We both didn’t hesitate to get our stuff and make the hour trip to La Jolla to visit her. I saw a lot of my family in the waiting room and quickly said hello. We went up to see her in her room where she was hooked up to all sorts of machines. Beatriz and I prayed over her and I remember telling her I loved her. She replied back, with her eyes still closed that she loved me too. We walked out and I couldn’t help but break down. Here was my aunt, a respected Escondido Police Officer and loved family member in pain. Who would have known that in a couple of days after that brief dialogue I had with my aunt, she would leave us to go home with the Lord? Oh wow, the memories I had spending time with her. She was very beautiful and her smile could easily light up a dark room. A very lively, goal-oriented woman with a passion to help others. She devoted her work to help juveniles who were in trouble, especially youth who were being abused. I remember when she would stop by our home when I was a kid. Mom would tell me, “Va venir Tere” (Aunt Teresa will be coming) and boy, would I get all excited. I made sure I prepared the latest report card or school project to show her because she always encouraged us to do good and congratulated us on our hard work. She sincerely cared. She sincerely loved every single one of us. And she is sincerely missed. I have devoted my last 9 months to take better care of myself in her honor. She was a YMCA Lifeguard and was very active. She took great care of herself and I figured if God is still giving me life, why am I ruining it by not taking care of myself? I was hoping to arrive to the 100-lb drop by tomorrow, April 2nd but, unfortunately, I have been met with some setbacks with my lower back. I do have to state that at 93-lbs down, I was VERY close!!! I had promised my friends on Facebook that I would be off Facebook during the Lent season. I have about a week left and maybe I can get even closer to the 100-lb drop. At 100-lbs down, that would put me at a healthy 160-lb body weight. I promised them I would post a before and after picture after I return to Facebook. We’ll see how that looks, hahaha! Anyway, I hope this week brings hope and relief with my lower back. I see a spine specialist on Wednesday at USC. I am praying to God that the doctor gives me some treatment options because four years into this has really worn me down! To wrap it up tonight, I wanted to post an image of my aunt. Five years certainly feels like yesterday and I miss her a lot! Love you Tía Tere! ~ by Aeroman76 on April 1, 2012. Juan, I really feel touch by the sincere letter you wrote. Vicky and I have her in our life too. She left her mark in every single one of us. You are right Juan, God sometimes takes the good ones way too early. Love you man and God bless! Thanks Jose! Hope all is well with you and the family! This entry was posted on April 1, 2012 at 9:38 pm and is filed under Family, Uncategorized, Weight Loss Journey.You can follow any responses to this entry through the RSS 2.0 feed.You can leave a response, or trackback from your own site.